Comments: Good Condition. Some crinkled pages. Five star seller - Ships Quickly - Buy with confidence! WebObjects is a web-application development environment which can be used to create dynamic web pages containing data from a relational database. 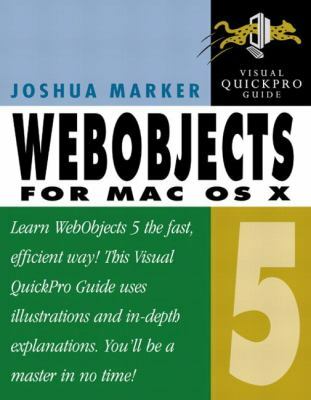 This task-based, visual guide shows how to build Java-based, scalable web applications with WebObjects.Crawford, Malcolm is the author of 'Webobjects 5 for Mac OS X', published 2003 under ISBN 9780321115492 and ISBN 032111549X. Loading marketplace prices 4 copies from $23.39 How does the rental process work?